Less than an hour before he resigned, Alan Shatter was taking questions in the Dáil. No-one fully expected him to resign this afternoon- but here’s why he did. IN THE END, despite the criticism and the damning reports, there was little to suspect that Alan Shatter would resign as Minister for Justice this afternoon. Less than an hour before his resignation was announced, he was in the Dáil taking questions in his role as Minister for Defence. Both the Taoiseach and the Tánaiste had said that they fully supported him as he dealt with body blows: yesterday, within minutes of RTE reporting that the Data Protection Commissioner found that Shatter had broken the law, both Enda Kenny and Eamon Gilmore said he had their backing – even before the report was made public. Within minutes of the news of his shock resignation, TDs and Senators were rushing through Leinster House to make it to the Dáil chamber to find out what had happened. In the end, it was not the GSOC bugging, the Data Protection Commissioner report or the dispute with rank-and-file members of the gardaí that led to his resignation. In his letter to Enda Kenny, Alan Shatter made it clear that it was the report by senior barrister Sean Guerin into the allegations made by garda whistleblower Sergeant Maurice McCabe which led him to tender his resignation. Exactly 65 days ago, the Cabinet agreed that Guerin would investigate the claims that An Garda Síochána mishandled a series of cases involving abduction, assault and murder. Maurice McCabe had given a dossier to Fianna Fáil leader Micheál Martin containing the allegations, which had then been passed to the Taoiseach. After reading it, Enda Kenny said that documents contained “extremely serious allegations of garda misconduct”. Seán Guerin, an experienced criminal lawyer, was given several weeks to carry out an independent investigation to see if there were grounds for the establishment of a Commission of Investigation. There has been growing controversy about what Alan Shatter knew about the allegations, and when exactly he became aware of them. One report suggested that Shatter had been notified about the allegations two yeas ago. The Guerin report, which was finalised this week, was given to Taoiseach Enda Kenny who gave Alan Shatter a copy of it this morning. In his resignation letter, Alan Shatter said that he had not had time to read the entire report, which runs to more than 300 pages. However, he said that he had read in full Chapters 1, 19 and 20, as well as the accompanying letter from Seán Guerin. In the report, which has not yet been made public, Guerin recommends that the allegations should be the subject of a statutory inquiry. Alan Shatter says in his letter that he does not want his actions in connection with the allegations to distract from Government work, particularly in the run-up to the elections. “I am anxious that any controversy that may arise on publication of the Report does not distract from the important work of Government or create any difficulties for the Fine Gael or Labour Parties in the period leading into the European and Local Government elections. “It is my judgement that the only way in which such controversy can be avoided is by my offering you my resignation from Cabinet”. In his letter, Shatter makes it clear that he was not entirely happy with the report, noting several “concerns and reservations” about it. He states that GSOC did not give any documents to Guerin in the preparation of the report, and that he himself was not interviewed about it. The report itself could not make any determination of the complaints made by Sergeant MacCabe, which are now likely to be examined by an independent inquiry. Two things will happen next: firstly, a new Minister for Justice will be announced either this evening or else tomorrow morning. And, crucially, the Guerin Report will be made public within the coming week and the full extent of the “extremely serious allegations” against some members of An Garda Síochána will become clear. And, since they were already serious enough to see the Minister for Justice step down, it’s likely that more repercussions will follow. Email “Explainer: Why Alan Shatter has resigned”. 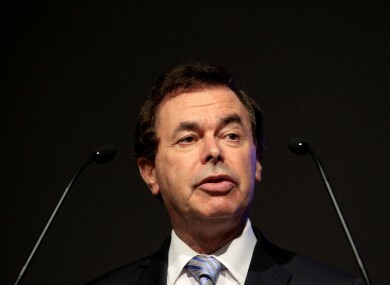 Feedback on “Explainer: Why Alan Shatter has resigned”.